While Xzibit pimps trashy cars, artist Thiago Mundano pimps trash carts. Brazil generates more than 200,000 tons of trash a day, with approximately one million trash collectors – known as catadores – responsible for 90 per cent of the country’s recycling efforts. Though vital to Brazil’s economy, in a recent TED Talk Mundano explained that their efforts go widely unacknowledged. 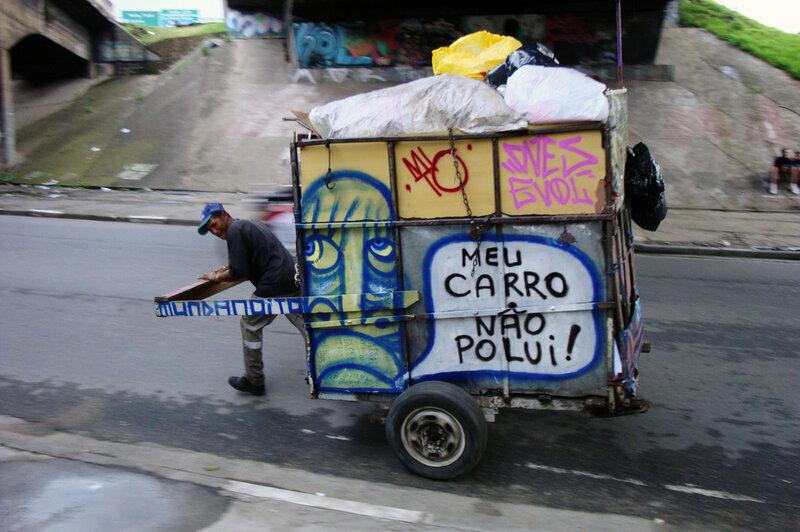 In 2007, in an attempt to underline the catadores’ efforts, Mundano began transforming their carts – carroças, as they’re called in Brazil – by decorating them with graffiti characters captioned with insightful slogans, many of which are underscored with political and environmental undertones. One reads: “If corrupted politicians were recyclable, they would be worth less than cardboard.” “One catadore does more than an environmental minister,” another jests. It didn’t take long for the movement to catch on. After his initial success, in 2012, Mundano began a movement called Pimp My Carroça. The program pairs up local catadores with artists who will paint their carts. In addition, Pimp My Carroça sets up stations where catadores receive free eye exams, psychological counselling and massages – there are even veterinarians on site to examine their dogs. These bi-annual stations also supply catadores with much-needed safety gear, such as mirrors, raincoats and glasses. Amongst a global consumer society saturated with convenience and instant gratification, Mundano gives voices to those who were previously unheard, whilst reminding us of an important yet often forgotten paradox – sometimes it’s those we recognize least in society responsible for that which we take most for granted.